V2_, Institute for the Unstable Media is an interdisciplinary center for art and media technology in Rotterdam (the Netherlands). V2_ presents, produces, archives, and publishes research at the interface of art, technology and society. V2_ offers a platform for artists, designers, scientists, researchers, theorists, and developers from various disciplines to discuss their work and share their findings. In V2_’s view, art and design play an essential role in the social embedding of technological developments. V2_ creates a context in which issues regarding the social impact of technology are explored through critical dialogue, artistic reflection, and practice-oriented research. Media and technology are omnipresent in contemporary society, and the same technological developments that are changing communication, politics, production, trade, urban culture, and medicine, are also transforming the arts. Art which applies electronic media especially digital or unstable reflects upon and takes into account the meaning, idiosyncrasies, and boundaries of such media. In this process, instability is a creative force that is essential to the continuous re-ordering of the social/cultural, political, and economic relations in society. Instead of providing us with an orderly, homogeneous worldview, unstable media present an image of a world that is inconsistent, heterogeneous, complex, and variable. V2_ is interested in the relationships and interactions between different media and in the relationship between art and scientific disciplines. The connections between art, technology, media, and society are continuously explored, by bringing together artists, scientists, and civil organizations and by initiating interdisciplinary collaborations. V2_ and its Lab are an instigator of artistic projects, which interrogate and illuminate contemporary issues in art, science, technology, and society. V2_Lab is an autonomous zone where experiments and collaborations can take place outside of the constraints of innovation agendas or economic and political imperatives. With its V2_Lab and the books published by V2_Publishing, V2_ offers a critical perspective on the futuristic promises that new technologies always seem to carry. V2_ was founded in 1981 as an artist collective and multimedia center that transformed into a center for art and media technology. In 1994, it moved to Rotterdam and opened the V2_Lab in 1998 as an extension of its practices towards art production, research, and knowledge exchange. V2_, Institute for the Unstable Media is an interdisciplinary center for art and media technology in Rotterdam (the Netherlands). V2_ presents, produces, archives, and publishes research at the interface of art, technology and society. Founded in 1981, V2_ offers a platform for artists, designers, scientists, researchers, theorists, and developers of software and hardware from various disciplines to discuss their work and share their findings. 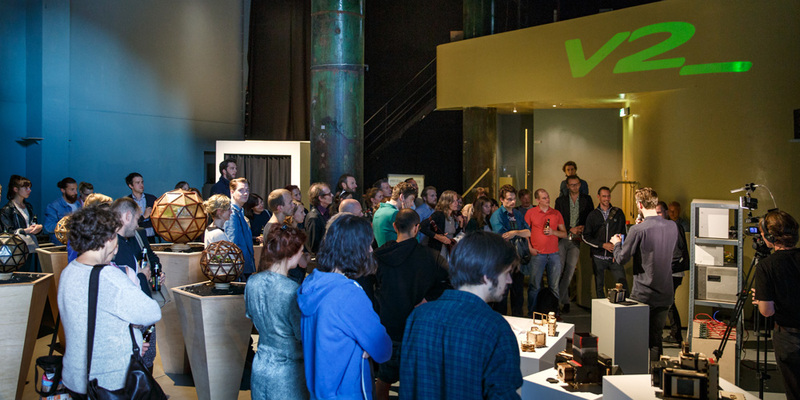 In V2_’s view, art and design play an essential role in the social embedding of technological developments. V2_ creates a context in which issues regarding the social impact of technology are explored through critical dialogue, artistic reflection, and practice-oriented research.